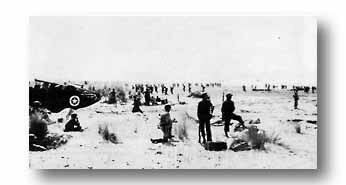 SMALL LANDING CRAFT (LCVP'S) MOVE INLAND PREPARATORY TO INVASION ON GRAY MORNING OF SEPTEMBER 9. From the high range of hills surrounding the Salerno plain, German artillery was emplaced to protect the invasion shoreline. The enemy had been forewarned of the approaching fleet and had issued an alert to its beach defenders at 1600 of September 8. Soon after the first two assaultwaves had slipped silently ashore under the cover of morning darkness, enemy gunners were aroused. At the medieval Paestum tower German machine gunners and snipers fired from the balcony. 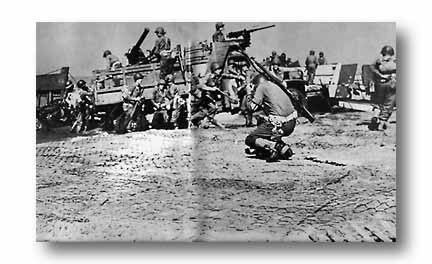 INFANTRYMEN POUR ONTO THE BEACHES AS BULLDOZER, LATER HIT BY ENEMY SHELL, WORKS TO CLEAR BEACH OBSTACLES. GERMAN ARTILLERY THROWS GEYSER WHILE ALLIED SMOKE SHIELDS LANDING. tOWER WAS ENEMY STRONGPOINT. 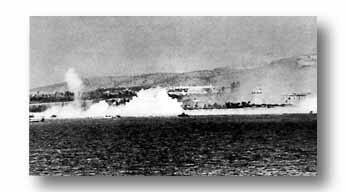 At daylight German artillery began to pound the beaches. 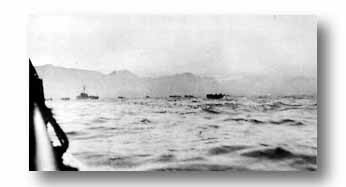 To counter, Navy craft laid smoke screens while landing boats laden with troops, guns and supplies edged in. As infantryment slugged forward toward their objectives, bulldozers and engineers feverishly worked to clear the beach obstacles, teller mines, and barbed wire. Engineers also prepared roads and outlets in order to receive the massing stores of supply. Enemy planes in ever greater numbers skipped in to harass the landing operations. 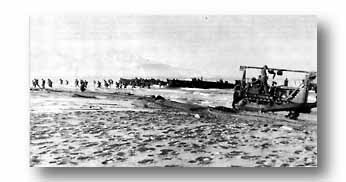 IN MID-D MORNING ITALIAN SUNSHINE IS CRISP, NAVAL BEACH OFFICERS SPEED UNLOADING AND TROOP MOVEMENT. Flushed with the excitement of making the long-awaited invasion of the Italan mainland, Texas Division troops disembark on-the-double. Enemy artillery fire has been heavy and machine guns on the trucks are trained skyward. The MP in foreground ducks instinctively as a shell hits nearby.